I guess this pretty well sums up what we are seeing in health care and in Puerto Rico. William Thornton wrote: Cheap shot nonsense. I agree. It's ihatetherepublicanparty, which is a double 1st cousin to the ihatetrump moniker. The Republican Jesus Facebook page is a boatload of degenerated nonsense. You can bet your bottom dollar that those agreeing with that nonsense are mostly "Progressive" Democrats. Dave Roberts wrote: I guess this pretty well sums up what we are seeing in health care and in Puerto Rico. I find it sad that some people want to think of Jesus as the great social Lord. There are many people in scripture who went unhealed. There were people who still died. POaul was not healed from the thorn in his side. Sorry - the God you like (in your submitted picture) is not the God of scripture. We do not get to dictate who He must help -- heal -- make happy. Well, you got three frumped-up frownies to fire back, and given who they are, you hit the nail on the head. It's really tough, if you want to stand on an inerrant, infallible Bible, to deny who Jesus is, so you have to hope no one actually looks it up. They know better, but tweets have trumped scripture, and politics have trumped theology, and the Jesus of the scriptures is different than the Jesus that has trumped him. Not sure which verse that is a parody of -- the one where Jesus told the government to do those things, or individual Christians? Rvaughn wrote: Not sure which verse that is a parody of -- the one where Jesus told the government to do those things, or individual Christians? I believe Jesus wants all individuals to support a government that does those things (feeding the hungry, helping the sick, welcoming the stranger/immigrants) and fill in the uncovered areas individually as well. It is both-and encouragement. The problems are big and we should be taxed so that the gvernmnet can fulfill these duties and others - to "make a more perfect union”. The cons herein will rail about this, but I think it is obviously both a governmental and individual command. That's an excellent point. There really wasn't a government "of the people" in Jesus' day, and the scripture he referenced was placing the example of the communal responsibility that had been part of the identity of the theocracy of Israel on the church. But carry the Biblical principles forward. The entire foundation of what has developed into the "Religious Right" in America has been to blur the lines of church-state separation to give the church, and particularly the more conservative, Evangelical wing of it, more influence over government policy, in order to place a set of Biblical principles and values into law. The most obvious push has been a pro-life stance against abortion, and resistance to extending any kind of civil protection and equal rights to those who don't conform to their specific view of gender identity or sexual orientation. They are more than willing to support a Biblical perspective imposed on government when it comes to those things. But if they've interpreted the Bible to allow for government "inclusion" in those areas, then it is completely inconsistent practically, and Biblically, not to apply it to everything, since there's no line drawn in the Bible to differentiate between what Christians should push the government to do and what it should not. And when it comes to the actual values themselves, Jesus placed a much higher emphasis on the social ministry accompanying the Christian conversion experience, to the point of a complete focus of his ministry on what we define, sometimes with derision, as the "social gospel." His preaching and teaching are so intertwined with his social ministry, that it is impossible to draw a line of separation, especially if you accept the scripture as inerrant and infallible. That's a nebulous and relatively meaningless use of the term "liberal." What it usually means, coming from a conservative, is a throw against the wall kind of term to see what sticks. It is an arrogant expression of derision, intended to place the user in a position of superiority, and to express the belief that he is right, and anyone who disagrees is wrong. It says that the user can't really find any specific principle or basis for the argument, just that it's not the way he thinks, and no interest in anything but his own narrow synapses. I always find it amusing that we all put Jesus in our camp. If so, then Jesus is a conservative/liberal/moderate. I suspect the truth is that he was all of these things------and so much more. If Jesus doesn't convict us in our direction, our politics, our attitudes toward government, toward riches and poverty, and in every other area, then there is a good chance we are manufacturing our own Jesus. It's interesting, isn't it, that all we know about Jesus comes from the New Testament, and most of the content that involves eyewitness accounts comes from three of the four gospels that are, when put together, a really thin book of about 100 pages, and the rest of it is found in the commentary left by a few other authors, John and Peter, James, Paul, one not known. We are taught in church how to follow the standard interpretations in order to develop a perspective of Jesus through our pastors and professors and their commentary. We're two thousand years plus away from the time when Jesus walked the earth, and I'm pretty sure that the image we have of him is a cultural distortion. There are some authors, Phillip Yancey comes to mind, Robert Funk, Marcus Borg, who do a good job of filtering out the cultural overlay, and make an honest attempt to identify Jesus through the scripture. But they all admit that it's not an easy job given what's been written, and that the Jesus we think we understand is not the one that you find if you simply put the scriptures together without the cultural baggage that comes with it. So if you accept the premises of an inerrant, infallible Bible, then you have to accept the thought that what's there is all we need to know and if that's the conclusion, then he is the criterion by which the rest of scripture is interpreted. That changes everything. For starters, it means that the "Kingdom of God" includes a whole lot more people than the modern church thinks it does, and the definition of knowing and following Jesus is much broader, and wider, and more accepting than we make it out to be. Yeah, let's put a proof text that has the potential to justify all manner of slander and denigration and discrimination against some of the least of these, our brethren through Christ, in as big loud typeface as we can! And that brings me back to Jesus question, slightly paraphrased, "And who is my "own?" Since all biblical relations between nations are family relations, then where does the kinship care stop, Jon? Are we not all members of one family? So, Jon, I would assume, from your literalistic prooftexting of one verse (taken out of context) that you are a conscientious objector to social security and medicare. Ordained ministers can do that. And you've duly refunded to the government any benefit you have ever received by using infrastructure, including electricity, water, highways, educational expenses (hope you didn't take a Pell grant, or attend a state college or university, or a public school ever in your life), and you refunded the difference for any medical care you received at a community or municipal hospital, or you paid back the subsidized cost of services at a church-owned and operated hospital. You've paid back the subsidized share of a student loan, you didn't use any FHA or VA benefit when you bought a house and if you did, you paid the bank back the subsidized interest rate. I think we need to note here that when Paul wrote this to Timothy, the Christian church was still largely a communal organization (similar to what was recorded in Jerusalem in the first few chapters of Acts) and being part of the local body of believers included taking care of your own family, in addition to providing for the needs of the church, which cared for the "widows and orphans." Paul is making a distinction between widows who had no extended family responsible for their care according to custom, and those who had a family member that could provide for them. The church took responsibility for providing for all of its faithful members who, under the circumstances of the culture in which they lived, could not provide for themselves, and Paul was especially keen on making sure that those who were elderly were not forgotten. Jon's singled out one verse that can't be interpreted in context standing alone. The early church was communal, and it was a "welfare state" in the sense that it took resources from those who had much, and used them to care for virtually all of its constituents who had nothing. One verse about ones family in a circumstance we do not have insight into. Today, many try but cannot support their family. You seem to be calling them infidels. You can hang onto the one verse if you must and apply it universally, but you should reconsider. It shows how an inerrantist selects what s(he) wants (ignoring much) which makes a mockery over their inerrancy stance. KeithE wrote: Today, many try but cannot support their family. You seem to be calling them infidels. It's worse than that. He's saying (or appears to be) that God is calling them worse than infidels. 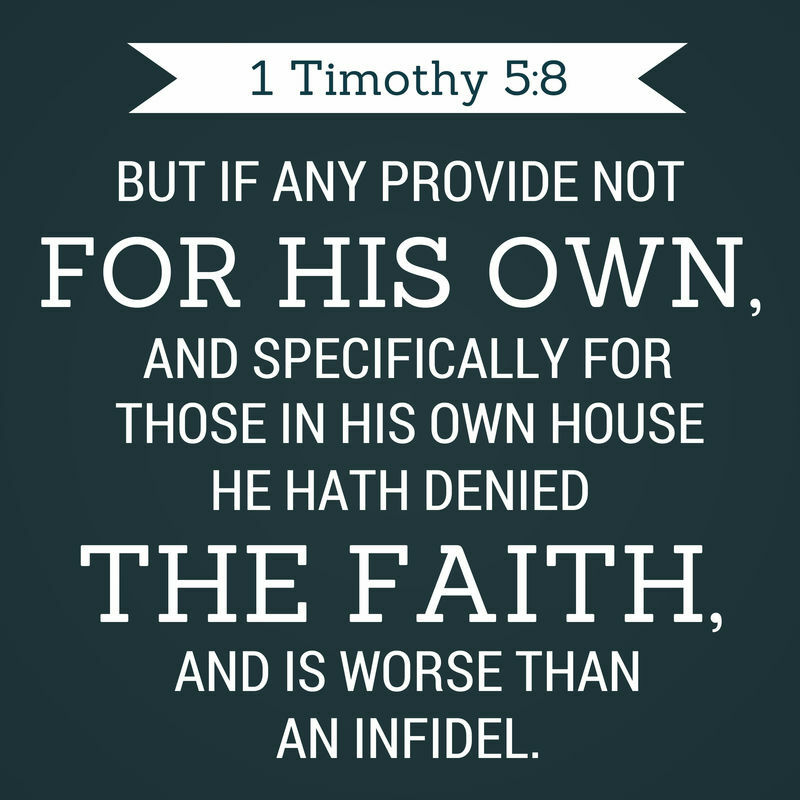 Contextually as 1 Timothy is speaking to the church in being helpful to those struggling through life, God's is very clear in what He expects from the Christian man... husband... father who has been given the charge to take the role of leadership in the home. The man who can work but won't work to provide for his family is useless. It is not the churches role to prop up the lazy man who has more excuses than drive to be a God fearing... responsible man leading the Family God gave him and has called him to lead/serve. I have dealt with many men asking for funds who take the government help instead of a low paying job. It is not the role of the church to be the husband... father in the home of the people. If you got a problem with God calling such men infidels, take it up with God or simply get your cultural scissors and cut another verse you disagree with out of His book. God doesn't stroke the sinner to smooth Him, why should we. KeithE wrote: It shows how an inerrantist selects what s(he) wants (ignoring much) which makes a mockery over their inerrancy stance. Inerrancy requires corroboration, and harmony, of the scriptures. If you prooftext single verses, or single thoughts literally, then there will be other single verses or single thoughts, taken literally, that conflict with each other. This particular verse is surrounded by a context that doesn't support Jon's intended use of it. It's in the middle of a passage about family responsibility for their relatives, including widows, leaving only those widows of a certain age, with no immediate family, in the care of the church. Well live with that context as well (lazy churchmen who can but do not support their family) and not use it as an argument against liberals who value helping the poor through whatever means is available including personal and governmental aid. I know it does not demand government aid but it does not prohibit it either. My argument is not against liberals here. It is pro scripture. Liberal or not - to deny the Bible teaches this, denies the Bible. If people want to give their money to lazy people - let them. Just don't ask for mine. To make a political comment (of sorts). Many people say the immigrants are here to take the jobs US citizens won't take. That says a lot about the lazy man who refuses to do a certain legal work because it is ___________________ (you fill in the blank). I've done labor jobs and I'll do them again if I needed. Shouldn't Christian men want to be the type of man God wants from the Christian husband/father? If God says doing less is the actions of an infidel - I say our Father knows best. If you are so pro-scripture, then go with the 50+ biblical verses that say to help the poor (after perhaps finding out whether or not they are lazy first). shows your unconcern for sick, and the poor (despite the the 50+ biblical injections to do so) and your dislike of those “liberals” who take it seriously. For the record, I’m in favor of workfare and welfare for those who cannot work through being disabled (or in times when work is not available - not true in most of the US at present but very true in places throughout the world right now). You do understand TIC... don't you? Yes. But it would make me happy to see the cons on this board advocate for the poor instead of calling them lazy (as a default position).